Apple's MacBook Air has come a long way since it was first released in early 2008. Originally intended as an ultra-portable supplement to your main Mac, it's long since grown powerful enough to use as your sole computer. This sixth-generation MacBook Air uses the same chassis and basic form factor as the mid-2012 MacBook Air that it replaces, but new processors bring a wealth of performance upgrades, though one or two compromises are evident. The 2013 MacBook Air faces stiff competition from the new Chromebooks. Eschewing Windows and Linux operating systems in favour of Chrome OS, these run web-based applications and are usually significantly cheaper than most notebooks. For example, the Samsung Chromebook cost just £230 / US$330 / AU$320 at launch. There are exceptions, of course. Google's own Chromebook Pixel is a gorgeous high-end notebook costing £1,050 / US$1,300 (around AU$1,730), which is more than either of the two 11-inch MacBook Air models in the mid-2013 refresh, but it proves cloud computers can be as stylish and desirable as an Apple notebook. If you want an ultra-portable Windows 8 laptop, the Samsung Series 9 NP900X3D has an Intel Core i5 processor and 128GB of flash storage like this MacBook Air, but its screen is 13 inches, and we're testing the 11-inch MacBook Air. The Lenovo ThinkPad X1 Carbon Touch is one of the thinnest and lightest Windows 8 netbooks on the market, and a very credible alternative to the MacBook Air if you prefer Windows to OS X. Since the late 2010 MacBook Air refresh, Apple has released four individual MacBook Air models with each generation. The mid-2013 release is no exception. Once again we have two 11-inch models and two 13-inch MacBook Airs. All use 1.3GHz dual-core Intel Core i5 processors from Intel's new Haswell range. The two 11-inch MacBook Airs have double the solid state storage of the previous generation of MacBook Air, at 128GB for the cheaper model we reviewed and 256GB for the more expensive 11-inch MacBook Air, up from 64GB and 128GB respectively. The 13-inch MacBook Airs retain their predecessors' 128GB and 256GB of storage, but are a little cheaper. 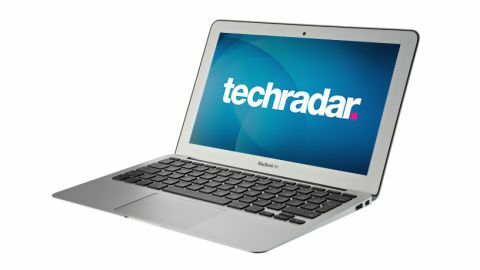 Even with the new Haswell processors, gamers, video editors and other high-needs users might prefer the power offered by a MacBook Pro, but the highly portable MacBook Air is perfect for students, business travellers and just about anyone who appreciates its incredibly thin and light design. The 11-inch MacBook Air 2013 with 128GB storage that we reviewed is the cheapest model in the range, priced at £849 / US$999 / AU$1,099. The 11-inch MacBook Air 2013's chassis is almost totally unchanged from last year's model. The only difference is a second microphone hole in the left-hand side, with the dual mic setup using adaptive beam forming to reduce background noise. But there seems little reason for Apple to change such a popular and practical design. At just 17mm (0.68 inches) at its thickest point and weighing just 1.08kg (2.38lbs), it's so light and portable it's easy to forget it's in your bag. It's sturdy too. If you lift it by the corner it doesn't creak and flex like lesser, cheaper notebooks, and little luxuries such as the multi-touch trackpad, backlit keyboard with ambient light sensor, magnetic power plug, stereo speakers and the 720p FaceTime HD camera are retained. The changes to the 2013 11-inch MacBook Air are all under the hood. The off-the-shelf processors are 1.3GHz dual core Haswell Intel Core i5s, though you can upgrade it to a 1.7GHz dual-core Intel Core i7 using the custom options on the online Apple Store. Haswell processors, the fourth generation of Intel's Core series, are designed from the ground up to use significantly less power than before, without compromising on performance. Indeed, their integrated Intel HD Graphics 5000 chipset gives up to 40% faster graphical power. The new MacBook Airs also feature the latest Wi-Fi protocol, 802.11ac. When used with a wireless ac router such as Apple's new AirPort Time Capsule and AirPort Extreme, your wireless connection is up to three times faster than Wi-Fi n, and boasts a much better range. Also, beam forming technology focuses the Wi-Fi signal onto connected ac devices, for a much more stable connection. One thing the new MacBook Air didn't get is a Retina screen. High-resolution Retina displays, already an option in the MacBook Pro range, have such a high pixel density that the human eye is unable to distinguish between pixels at normal reading distance. Many expected it at least as an option in the 2013 MacBook Airs, but it's not to be. The display we get is 1366 x 768 resolution, beautifully consistent and blessed with excellent viewing angles, but it isn't Retina. At 128GB and 256GB respectively, the two 11-inch MacBook Airs have twice the storage they had before, and they use faster flash too; it's up to 45% quicker than the previous generation, and around nine times as fast as a regular notebook's hard drive. If you need more, you can upgrade the higher-end 11-inch MacBook Air's storage to 512GB using the online custom options. Like the previous generation, all the new MacBook Airs offer 4GB of RAM off the shelf, which is upgradeable to 8GB. The RAM is soldered to the logic board and is not user-upgradeable, so if you want more than 4GB, best use the online custom options. As before, the 11-inch MacBook Airs have two USB 3.0 ports and a Thunderbolt port, though again there's no SDXC card reader, as enjoyed by the 13-inch models. Like all new Macs, the 2013 MacBook Airs come supplied with OS X 10.8: Mountain Lion, and also Apple's popular iLife suite. On paper, the dual-core Intel Core i5 processors have taken a backward step, running at 1.3GHz against the previous generation's 1.7GHz. But the new architecture with its improved graphics, and the faster flash storage, means the 128GB 2013 MacBook Air put in a mostly impressive performance in our benchmarking tests. In our Xbench test, which measures processor and hard drive speed, the new MacBook Air was 2.6% up on its predecessor. While this is of course welcome, it's clear the advantage gained by faster storage is partly offset by the slower CPU. There's nothing slower about the graphics performance, though. In our Cinebench 10 test, the new MacBook Air was just under 12% faster than the same machine from previous generation when using a single thread. But with both the processor's cores in play - running two threads on each due to its Hyper-Threading feature - it's only 6.3% up, as the 2012 model's faster clock speed narrows the gap. The new Intel HD Graphics 5000 chipset proved its worth when running Call of Duty 4, increasing the previous model's 59 frames per second to a snappier 69.3fps, a significant increase. But the older Doom 3 seemed less able to take advantage of the superior graphics, and actually slowed from 81.9fps to 69.6fps. Unfortunately, the new 11-inch MacBook Air is also significantly slower at video rendering, taking 243 seconds to re-encode our test video to iPod format. This is 26 seconds down on last year's model. The MacBook Air's deep sleep mode means you can leave it on with the lid closed for around a month on a single charge, during which time it wakes from sleep in around one second. It's like having an iPad's always-on convenience in a notebook. Not that it takes long to boot when switched off. In our tests, a clean install of Mountain Lion booted in just 18.5 seconds. And naturally, the battery life is incredible. Apple tells us the 11-inch MacBook Air 2013 can last for up to nine hours on a single charge, and play back iTunes videos for up to eight hours. In our test, we set the screen brightness to around 50% and streamed the news channel on BBC iPlayer for an amazing seven hours, 15 minutes. This is more than double what its 2012 counterpart could manage. You can comfortably use a 2013 MacBook Air all day without recharging, regardless of what you throw at it. The 2013 MacBook Air refresh is not a radical overhaul. The extra microphone aside, the chassis is identical to last year's MacBook Air, though there are significant improvements under the hood. Unfortunately, there are one or two drawbacks too. The new low-power Haswell processors really boost the MacBook Air's battery life. You can run it for an entire day on a single charge. The Haswells bring better graphics too, with the Intel HD 5000 integrated chipset giving a speed boost of up to 40%. Solid state storage is doubled compared to the previous generation, and faster flash storage brings a welcome performance increase. The new MacBook Air is the first Apple computer to adopt the new Wi-Fi ac protocol, which is up to three times as fast as wireless n.
The 1.3GHz Core i5 processors used in this generation's MacBook Airs have a slower clock speed than their predecessor's 1.7GHz Core i5s. Although the better graphics performance and faster flash storage make up for this in most real-world applications, we wish the new chips at least matched the old ones. And sadly, the Retina screen option many hoped for didn't appear. The 2013 MacBook Air 11-inch takes Apple's ultra-portable notebook a significant step in the right direction, but it's by no means a great leap forward. It makes advances in some key areas, most notably graphics performance and faster flash, but these are partly held back by the slower CPUs. Many will bemoan the lack of a Retina display too, at least as an optional extra. But factor in the better battery life and improved Wi-Fi, and the 2013 MacBook Air is a clear win overall.